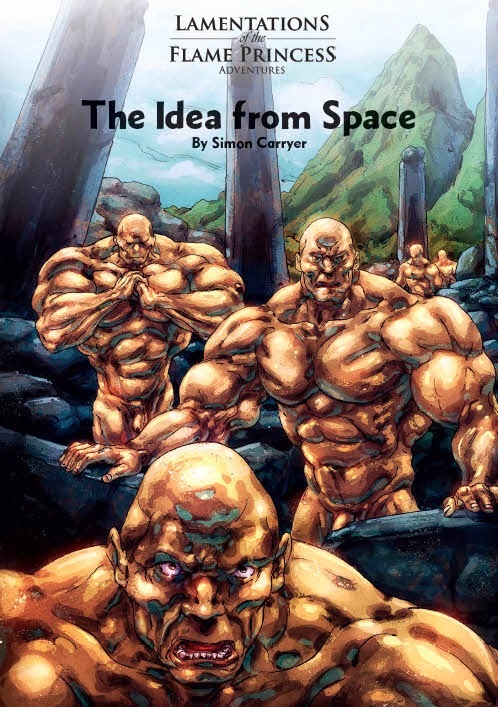 LotFP: RPG: The Idea from Space! Now I think R&PL has a lot of hype happening (it's been anticipated in some quarters for years), Death Frost Doom and Stargazer are well-known adventures and you know if you want them in print or not, and NSFW just had the crowdfund thing to get people interest and the hype going. But The Idea from Space? It's time to tell you about that so you don't leave that out while filling up your shopping cart. 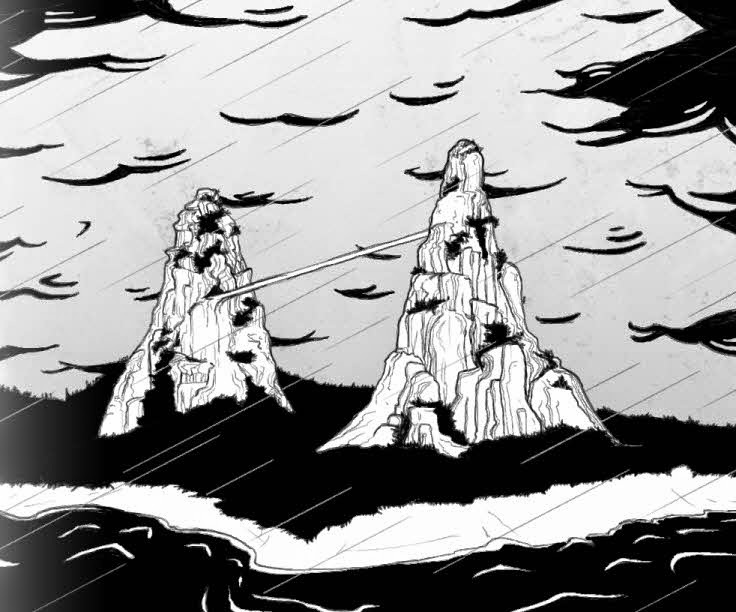 The adventure takes place on a small island (in the adventure part of the Tierra del Fuego archipelago, but easily transferrable to a remote island in your own campaign world) where two supernatural forces have had an age-old feud. There is Manakata, a primal spirit of power and physicality, which grants its followers great physical attributes. It's these followers that are on the adventure's cover. Then there's Xaxus, a sophisticated entity all about the mind, granting its followers supernatural mental abilities. These entities have been dormant on the island for quite some time. Then a shipwreck, a divided crew, and now both entities again have followers and again they war with each other through their followers. And into this mess come the player characters. Both factions will want to recruit the PCs and share their power with them. Both factions want the other faction wiped out. Both factions want to get off the island and grow into the greater world. Will the PCs side with one faction or the other? Or neither of them? Will their allegiances split like those of the crew of the wrecked ship? Will they help one or both factions spread into the world or will they be trapped on the island? Will they discover strange secrets the island contains, or find any of the rich treasures? Written by Simon Carryer, cover art by Olli Hihnala, layout and interior art and maps by Sarah Richardson. A Red & Pleasant Land: More Info! New Books at the Printer, Out in October!